As you know I love cooking and trying out new recipes. From time to time I come across something that I like to share with others. I'd like to share this particular recipe as it's the meal I've most enjoyed in recent times. Now, to enjoy this recipe to it's fullest, you need to tramp for 9 hours ensuring that you ascend at least 1200 metres and then descend back down 1200 metres. Make sure the last few hours are in the dark and that there is no clear track to travel on. And, just to ensure you've worked up an appetite, the last 200 metres should be through impenetrable bush with loads of supplejack. Cook up some onion, garlic and chilli in a little oil. Put aside. Lightly boil some broccoli, cauliflower and carrot. Add dried mashed potato to the vegetables. Stir well. Add onion, garlic and chilli and stir. Add a tin of tuna. Serve and eat immediately. I forgot to mention, try turn up to the hut late in the evening when all other trampers are tucked up in bed sleeping. I'm sure they didn't mind us arriving then cooking our dinner. This trip was an overnight into the Tararua Range. We parked at Holdsworth road end and then headed up the Gentle Annie track. We stopped for a lunch snack at Mountain House Shelter then carried on up to Powell Hut for another quick break. From there we climbed another 100 metres or so (a total climb for the day of 1200 metres) until we reached the turnoff for High Ridge. That's the signpost in the photo below. This photo is the start of High Ridge. You basically walk along the top of the ridge. 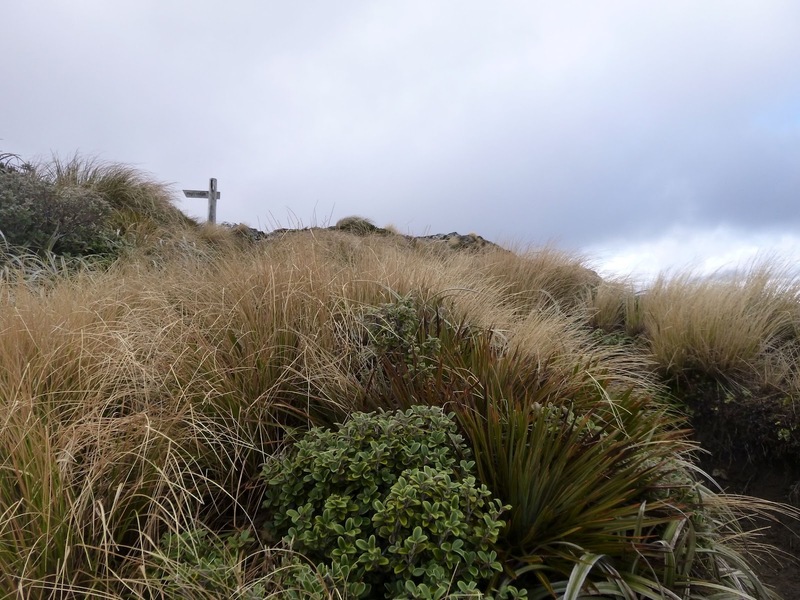 At first it's open tussock and then further along the ridge you get into bush. It's a little rough in places getting into and out of the bush but not bad once you're in it. We walked along to Flaxy Knob which is the bush covered rounded bit in the distance on the right of the photo. From there it's a descent back down to 200 metres to Totara Flats Hut. 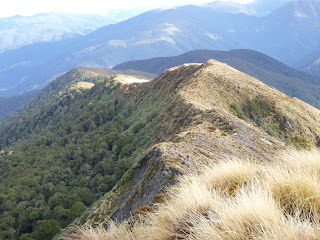 The following photo is looking back up the ridge to the start point. From Flaxy Knob the route is less easy. There was a lot of windfall and, of course, it got dark soon after we started descending. We lost the route a few times but managed to get back onto it with a bit of scouting around. 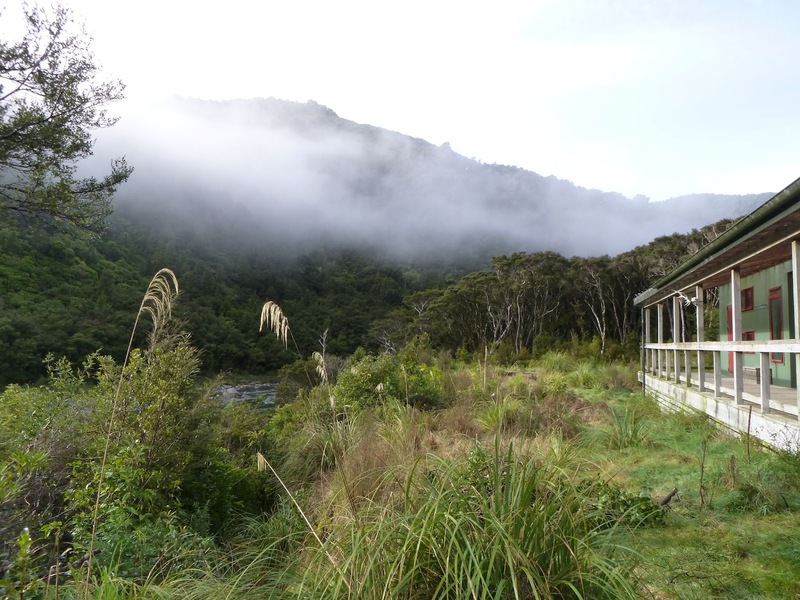 Finally we were about 200 metres from joining up to the main Totara Creek track when we lost the route again. At this stage some bright spark put forward the idea that it would be quicker to make our way through the bush than it would be to spend time finding the route again. That was one of those statements that I wish I'd never made!!!! It took us an hour to travel the 200 metres. The bush was pretty thick, the ground was quite rugged in places and the supplejack was rife. For those that haven't experienced walking through supplejack it's like some awful nightmare where you are constantly trying to climb over vines, duck under other vines, getting vines stuck on the top of your pack etc. Not a lot of fun and certainly slows down forward progress. 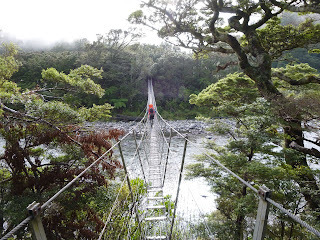 Once we joined onto the main track it was a matter of minutes to get to the hut over the swingbridge. By now it was after 9pm. It had been a long day. But, that meal was divine! And the whiskey in front of the fire went down pretty well too. The following morning we woke to a little bit of mist but the weather remained calm and dry - both important when out tramping in the Tararuas. Makes for a much more enjoyable day. 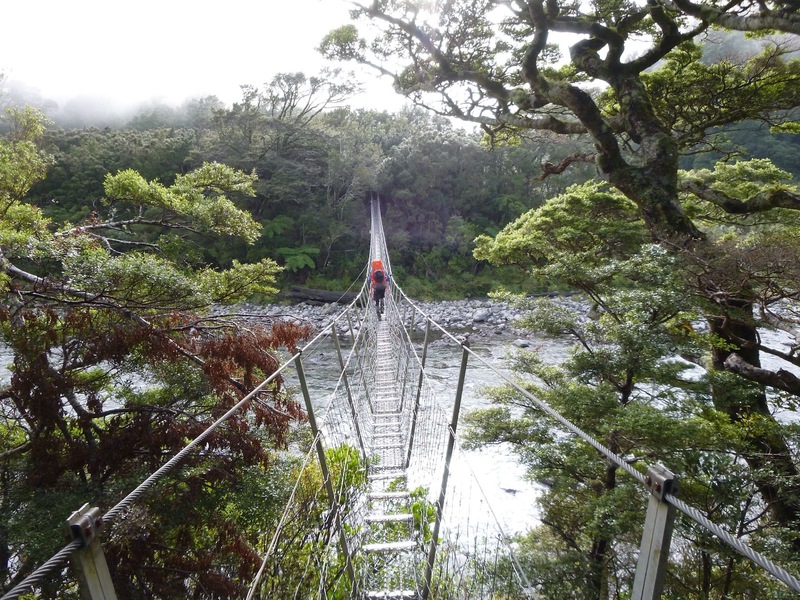 Soon after leaving the hut there's an impressive swing bridge across the Waiohine River. The walk out to the carpark was a lot shorter and more straight forward than the previous day. 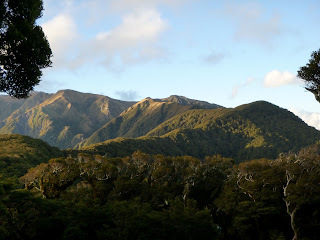 Basically a walk up the Totara Creek track which joins back onto the Gentle Annie track. The walk out took us three and a half hours all up. The climb was only about 500 metres or so. A lot easier than the day before. That's another corner of the Tararua's that we can tick off. If you're thinking of doing this walk it would be prudent to get down off High Ridge in daylight hours. Oh, and if you lose the route, find it again!